Opower is a white label company that works with utility companies to help customers better understand their energy usage and drive energy savings. It all began with a simple task; create a new product that would drive energy savings. Myself and two other designers accepted the challenge and started thinking about what experiences could be improved in our current products. This had to be something engaging that could influence a behavioral change and increase energy savings. This was my first project at Opower. Although I was still new to the company and figuring things out (like the product acronyms, so many acronyms! ), I was excited to jump in and tackle this problem. I was slated as part of a small team of three people working on one product, but was available to hop on other UX teams when needed. On my team, I split responsibility with my two teammates, brainstorming, whiteboarding, ideating, wireframing, participating in critiques, creating assets for presentations and user testing. We started this project by figuring out who the target user would be. Opower already had a product out there for the masses, but initial research found that choosing a smaller group of people to focus on would be the most engaging experience and most beneficial. After playing out the current experience for 3 different groups of users: high energy users, average energy users, and efficient energy users, we decided the high energy users had the most unpleasant experience, and often disengaged with the reports after receiving them only a few times. After a session of brainstorming and whiteboarding we agreed that the current experience for a high-energy user was not a pleasant one. To break the flow of always receiving reports that said, “You are using more than your average neighbors,” we wanted to create a “campaign.” A campaign would be defined as a short period of time where a user would receive a new set of reports, different from what they had previously received. Now to figure out what these high user campaigns would be. 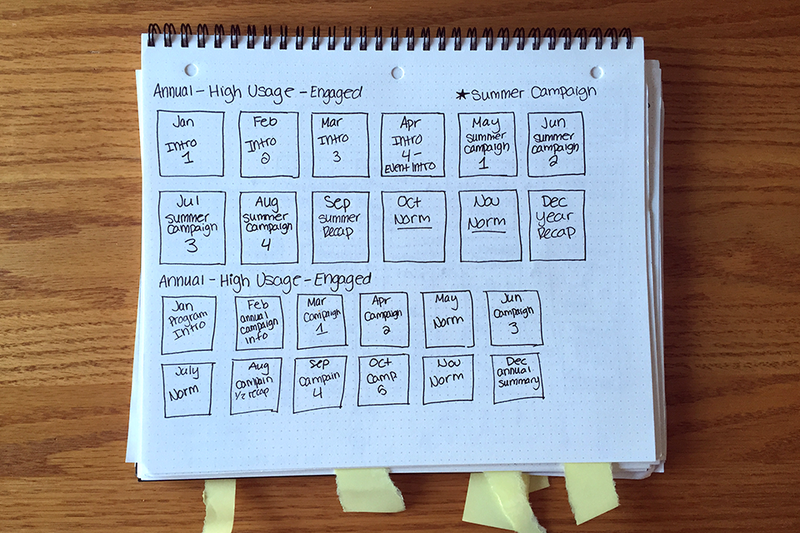 We looked at how this campaign might look when applied to the customer journey. What emotions would our high-energy users feel and what might be a good cadence in which they should receive these reports so they don’t feel too overwhelmed but stay engaged with the reports. We knew we wanted to create a neighbor comparison that was tailored for high users. We also wanted a tracking component, so users could see how they have been doing over the course of this campaign. We started by getting a bunch of ideas out there and started to look at things we liked. From there we chose 3 concepts in which to continue ideating, refine and start user testing. 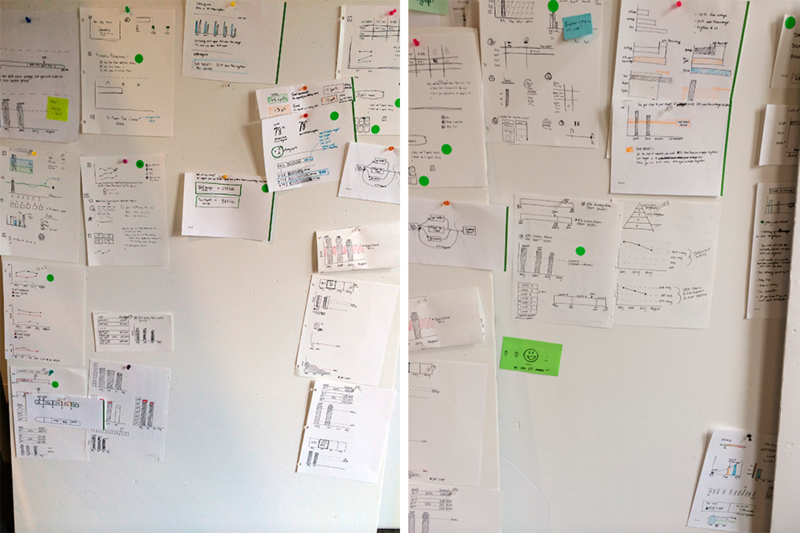 Using strategies from the lean UX method, which emphasizes quick ideation and user testing, we continued on the path of iterating and testing, increasing the visual fidelity as time went on. Often we would switch which concept we were working on to keep the ideas fresh. This was my first real experience with user testing. At first I just observed my co-works moderate the sessions while I took notes. But after about three tests it was my turn. It was painfully awkward, or at least I thought it was, but I had a lot of encouragement from my team and helpful feedback. I kept moderating and soon enough figured out my user testing flow. We tested locally in-person, as well as remotely to ensure we were reaching and designing for a wider demographic. We continued refining based on feedback and user testing. We finally landed on a single concept that everyone, user included, was happy with and excited about. This product was launched August 2014. UX, it turns out, is not just for screens. Prior to Opower, I had limited UX experience, mostly working with mobile and web. 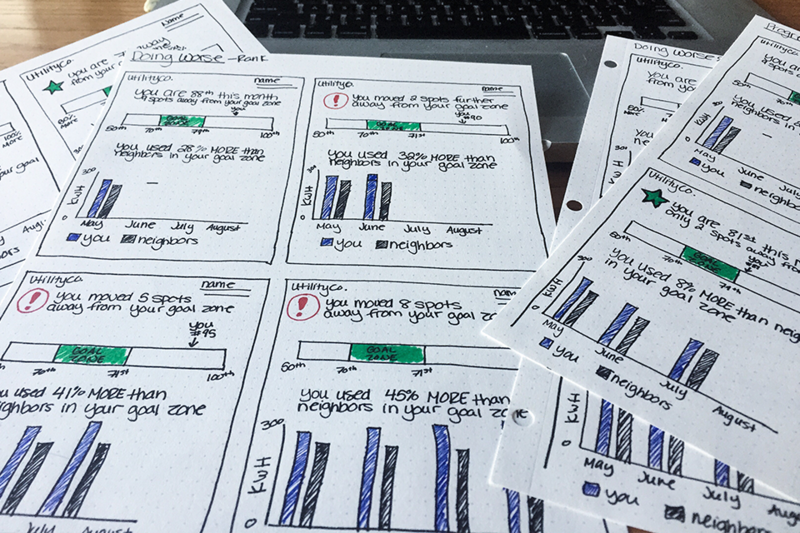 Who knew UX could apply to paper reports? Or emails? This really opened my eyes to what UX really is, the total user experience. I loved being thrown into a big project, and was fortunate enough to see the project come to fruition. I was able see everything that went into creating a new product from the UX side, from designing to working with product managers, engineers and marketing. This project started as such an open-ended question, it could have gone anywhere, but developing and uncovering a new product was an incredible, exciting experience. Needless to say, I was hooked and ready for more.